After spending years on many metal collectors' must-have lists, with original CD copies going for ludicrous prices on eBay, there now seems to be an abundance of DÉTENTE — not only was their lone album, "Recognize No Authority", reissued by bassist Steve Hochheiser under the Cognitive Records name a few months back, but it also seems to have come out as part of the Metal Mind label's continuing series of limited-edition reissues. Whichever version you find, it's a safe bet you won't have to hock the silverware for it, finally (we have the Cognitive edition for review here, for the record). DÉTENTE is perhaps better known as the answer to a few metal-oriented trivia questions than for their music — nu-metal producer Ross Robinson got his start in this band as a guitarist, while vocalist Dawn Crosby went on to a stormy career in the more experimental FEAR OF GOD before succumbing to alcohol-related liver disease at a young age. And the album was produced by — of all people — Dana Strum of VINNIE VINCENT INVASION (and later of SLAUGHTER)! But obviously, with so many people still willing to track down this album, there's gotta be something going on here musically as well. 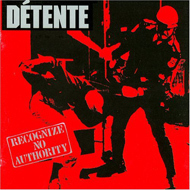 DÉTENTE circa 1986 were knocking out a loose, frantic brand of west coast thrash tinged with punk and trad-metal, drop-kicked somewhere in the neighborhood of old MEGADETH, HOLY TERROR, SENTINEL BEAST (who, to be honest, were about ten times better) or any number of minor-league bands of the era. That's not a knock — there are some great tunes here, and a ferocious, almost feral spark, that makes this band worth checking out twenty years later, a must-have for that particular strain of denim-bedecked thrasher who has to have it all. Vocal banshee Crosby gets the lion's share of the attention, hopefully due as much to her leather-lunged, maniacal delivery as for her gender and personal demons. While she displays little of the demented croon she unleashed on FEAR OF GOD's 1991 debut, "Within the Veil", she's pretty much full-on screaming for her life here, hoarsely shrieking through dated reverb over these thrashing tunes in a way that's gotta go against every vocal coaching exercise ever devised. It works to great effect on the more rapid-fire numbers, like "Losers" and the galloping "It's Your Fate", and conveys the true pathos and agony in prescient lyrics like "Life Is Pain" and "Shattered Illusions". The rest of the band are no slouches, either — the riffing, while fairly typical for the day, is well-done and effortlessly shredding, with plenty of headbangable moments to be had. These guys could pull off some fairly ornate solos and dazzle with a little of that start-stop pseudo-technicality we all ate up so much back then (see the instrumental "Catalepsy"). Like many of their peers, they had a hard time keeping the interest going on slower songs (see "Vultures In the Sky" and "Life Is Pain"), which often seem perfunctory and forced, without the spirit and fire of the faster tunes. But there's not a bad moment on "Recognize No Authority" -- even when it drags a little, you're not far from being pummeled by some righteous riffing and those raw, haggard vocals again. Check out "Widow's Walk" for arguably the band's finest moment — some fancy bass work from Hochheister, evil screams from Crosby that foreshadow her vocal gymnastics in FEAR OF GOD, and some tempo shifts that indicate this lineup would have probably matured into something world-class, had they been given the chance. As Roadrunner ads used to say, "some music was meant to stay underground", and that's definitely where DÉTENTE belongs — not a standard-bearer or innovator, but definitely a worthy second-tier band that brings a helluva lot of enthusiasm and fire to their take on mid-80's thrash. Grab this before it sinks back into the murk of obscurity and becomes yet another generation's collectible Holy Grail.